This is the song that was written for the last film of the great French comic Fernadel. The title of the song was also the title of the film. In writing the melody, Brassens collaborated with the famous composer, Georges Delerue(4). 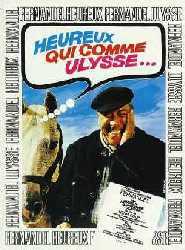 The film script and the words of this song were written by Brassens’ old friend, the film producer, Henri Colpi(3) , whom Brassens knew from his time in Sète. Both men loved this area of southern France and although their eventful lives had led them away, when they returned, they relished the places where they had spent their happy earlier years. The very famous poem by Joachim du Bellay (1525 -1560), from which this song takes its title, was learnt at secondary school by all pupils of the generation of Colpi and Brassens. Colpi uses du Bellay’s sonnet not only for the sources of his titles and for the first two lines of this song but for the theme of the quest for a lost idyll after years of trials and tribulations. Fine to be free ! Mon cheval, ma Provence et moi. My horse, my Camargue and myself. 3) Henri Colpi (1921 -2006) was a French film director, who made his name with the film Une aussi longue absence (1961), which included music by Georges Delerue(4). He was also a successful film editor and worked on about twenty films including Hiroshima mon amour (1961) and L'Année dernière à Marienbad (1963). 4) Georges Delerue (1925- 1992) was a very talented and a very prolific composer for cinema and television. During his 42 years career he wrote music for 325 long and short movies, 70 TV films and 35 TV serials. Directors he worked for were François Truffaut, Jean-Luc Godard, Alain Resnais, Louis Malle, and Colpi – as mentioned above. In Hollywood, he wrote scores for two Oliver Stone films. 5) La liberté! - Un ami - Mon cheval There are references in this poem that do not seem to fit well with Brassens. The declaration of liberty seems unnecessary -and perhaps over-dramatic- for some-one who had lived independent of the strictures of state, church and conventional social code all his life. The possession of one friend does not fit in with Brassens to whom a wide circle of friends was important. We do not think of Brassens as a keen horseman. The animals that were important in his life were his cats. The explanation is that this was the theme song of a film and these references relate directly to the plot. The old man, who is the central character of the film, discovers that his beloved old horse has been sold to the picadors of the bullring, where it will face a cruel death. His answer is steal the horse and lead it to the Camargue, where he releases to roam safe and free among the wild white horses. The link between Du Bellay’s poem and his biography interests me. Joachim du Bellay was born in 1525 in the little market town of Liré near to Angers. From an early age he had a great interest in literature. At the age of twenty-three years he struck up a friendship with the poet, Ronsard and became determined to make this his own vocation. In the following year (1548), he followed Ronsard to Paris and went on to publish a collection of sonnets in the manner of Petrarch: “The Olive”. However soon afterwards, he had to leave Paris to go to Rome, where he was to work as secretary to his cousin, who was a cardinal. At first, du Bellay was filled with enthusiasm for the antiquities of the eternal city and wrote in praise of them (les Antiquités de Rome). However later he became very disillusioned by the less commendable features of life in Rome and in the Vatican. He began to long for “la doulceur angevine”. Sadly, his life after his return to France was not the idyll to which he had looked forward during his exile in Rome. As a result of his criticism of the Church, he found himself deprived of the protectors who had financed him and he lived in relative poverty. He was in failing health and died in 1560, when he had only just turned thirty-five. As the years went by, his poetry had become more subjective and spontaneous. This poem “Heureux qui comme Ulysse”, shows his fluency and ease of expression and, from our acquaintance with his life story, we know that it is written from the heart.